Travis Kvapil picked up the 2nd last-place finish of his NASCAR Camping World Truck Series career in Saturday’s Kroger 250 at the Martinsville Speedway when his #1 Bubba Burger / Kioti Tractors Chevrolet fell out with rear gear issues after he completed 83 of the race’s 258 laps. The finish was Kvapil’s first of the season and came in his 149th series start. It was his first in 89 Truck Series races, dating back to February 25, 2011, when his #5 International Truck / Monaco RVs Toyota crashed after he completed 99 laps of the Lucas Oil 150 at Phoenix. Kvapil, the 2003 Truck Series champion, has spent much of early 2015 trying to get Team XTREME Racing’s #44 Phoenix Warehouses Chevrolet into its second Cup Series race of the season. 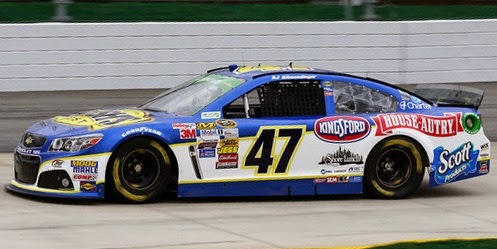 Following the well-publicized theft of the team’s car at Atlanta, however, Kvapil failed to make the next three races at Las Vegas, Phoenix, and Fontana. Ultimately, the team withdrew from the Martinsville race in order to prepare for the series’ next round at Texas. This left Kvapil free to focus on the Truck Series event. 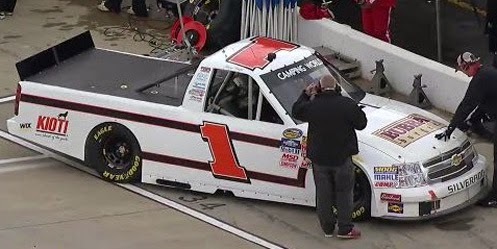 Kvapil’s Martinsville ride was fielded by Mark Beaver’s MAKE Motorsports along with, according to reports, some assistance and sponsorship from Rick Ware Racing. It would be the third different team Kvapil would drive for in the series this season. He qualified outside-pole for the Daytona opener in Premium Motorsports’ #94 Chevrolet and finished 15th, then withdrew from the Atlanta event after being tabbed as driver of John Corr’s #82 Ford. 36 trucks arrived at the track to make the field of 32, but Kvapil had a Past Champion’s Provisional on hand to make the field. Though just 33rd-fastest in the opening practice session, Kvapil used the provisional to secure the 32nd and final starting spot. Missing the show were Wendell Chavous, now driving Kvapil’s Premium Motorsports entry, Brandon Brown, Paige Decker, and Chuck Buchanan, Jr. Decker and Buchanan, the slowest two drivers in qualifying, are still gunning for their first series start. In Saturday’s race, Kvapil held the 32nd spot, but was passed on Lap 4 by Jennifer Jo Cobb and her #10 Driven2Honor.org Chevrolet. 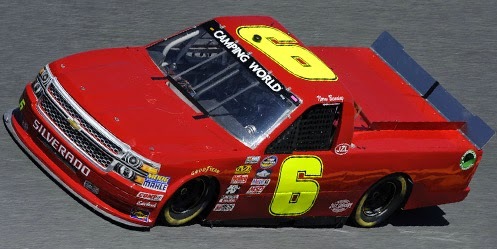 Cobb was the first driver to lose a lap and was down by 2 when she was passed for the spot by Atlanta last-placer Norm Benning and his bright red #6 Norm Benning Racing Chevrolet. Cobb briefly retook the spot on Lap 73, but then Kvapil made an unscheduled stop under green on Lap 86. 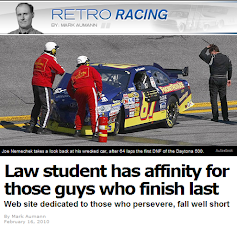 Citing rear gear issues, Kvapil did not return to the race, making him the first retiree. Cobb finished 24th while Benning rounded out the Bottom Five in 28th. Between Kvapil and Benning was 31st-place Bryan Silas, who around Lap 100 tagged the wall on the backstretch, causing his #99 Kapoya Premium Energy Drink Chevrolet to trail smoke for several laps. Despite several repairs, Silas left the race just a few laps later with overheating issues. 30th went to Cup Series regular David Gilliland, who after qualifying 8th and running in the Top 5 early lost the brakes on his #92 BTS Tire & Wheel Distributors Ford just after the halfway mark. 29th went to a frustrated John Hunter Nemechek, who broke the transmission while running 5th on Lap 176, then brought out the yellow when his #8 SWM / D.A.B. Constructors Chevrolet stopped at the entrance to the garage. *This marks the first last-place finish for the #1 in a Truck Series race since November 8, 2013, when D.J. 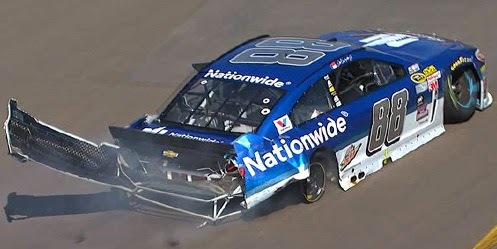 Kennington’s PocketFinder Chevrolet crashed after completing just one lap of the Lucas Oil 150 at Phoenix. The number had never before finished last in a Truck Series race at Martinsville. 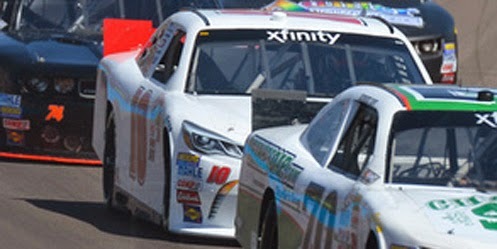 Jeff Green picked up the 63rd last-place finish of his NASCAR XFINITY Series career in Saturday’s Drive4Clots.com 300 at the Auto Club Speedway of Southern California when his unsponsored #10 TriStar Motorsports Toyota fell out with brake issues after he completed 2 of the race’s 150 laps. The finish came in Green’s 395th series start and his third last-place run in a row. When the series next competes at Texas on April 10, Green will have a chance to tie his own record as NASCAR’s only driver to finish last in four consecutive races. Green’s previous streak occurred in the XFINITY Series in August 2011. Green was one of three drivers who did not participate in the opening practice session, then timed in 35th in Happy Hour and 33rd for the race at an average speed of 171.127 mph, the slowest car that did not need a provisional to start the race. Under green 2 laps into the event, Green pulled behind the wall. David Starr was the highest-finishing of Green’s teammates, coming home 15th in the #44 Zachry Toyota, one spot ahead of Cale Conley in the #14 Iraq & Afghanistan Veterans of America Toyota. Finishing 39th was Carl Long, whose Lap 18 exit due to suspension issues put Derek White’s #40 Braille Battery / Grafoid Dodge into the next-to-last spot for the third time this season. 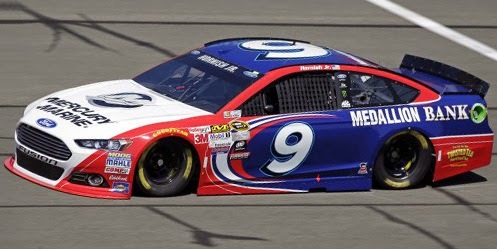 38th went to Austin Dillon, the Las Vegas winner, who after starting 7th lost the engine on his #33 Ruud Chevrolet after 42 laps, followed five laps later by Cup Series last-placer Sam Hornish, Jr., and his #98 DenBeste Water Solutions / Biagi Bros. Ford. Finishing 36th with suspension issues was Dakoda Armstrong and the #43 WinField Ford, his first-ever finish inside the Bottom Five. *This is Green’s second-consecutive last-place finish in the XFINITY Series race at Fontana and his fourth out of the last six. *Green is the first driver to finish last in a XFINITY Series race at Fontana with brake issues as the listed cause since October 10, 2009, when Chase Miller’s #47 ConstructionJobs.com Toyota exited after 3 laps of the Copart 300. 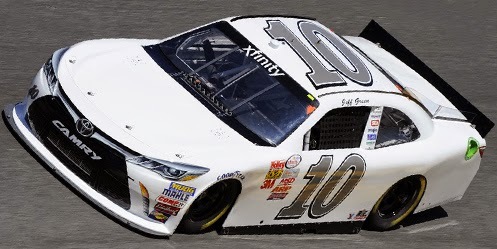 Jeff Green picked up the 61st last-place finish of his NASCAR XFINITY Series career in Saturday’s Boyd's Gaming 300 at the Las Vegas Motor Speedway when his #10 Holiday Inn Club Vacations Toyota fell out with a vibration after he completed 3 of the race’s 200 laps. The finish came in Green’s 393rd series start. It his first since last fall’s season finale at Homestead, 3 races ago. In all Green, now has 66 last-place finishes across NASCAR’s top three divisions, 27 more than the next-highest mark set 39-time finisher Joe Nemechek. Green returned to the XFINITY Series in 2015 for his sixth season driving for Mark Smith’s TriStar Motorsports. At the Daytona opener, Green timed in a solid 22nd, having not turned a lap in Round 2 of qualifying after is flat white Toyota made the cut. However, when TriStar teammate Scott Lagasse, Jr. failed to make the show in the #19, Green stepped out of the car so Lagasse could drive. The team managed to re-skin the car just in time for the race, where a crash left him 37th. 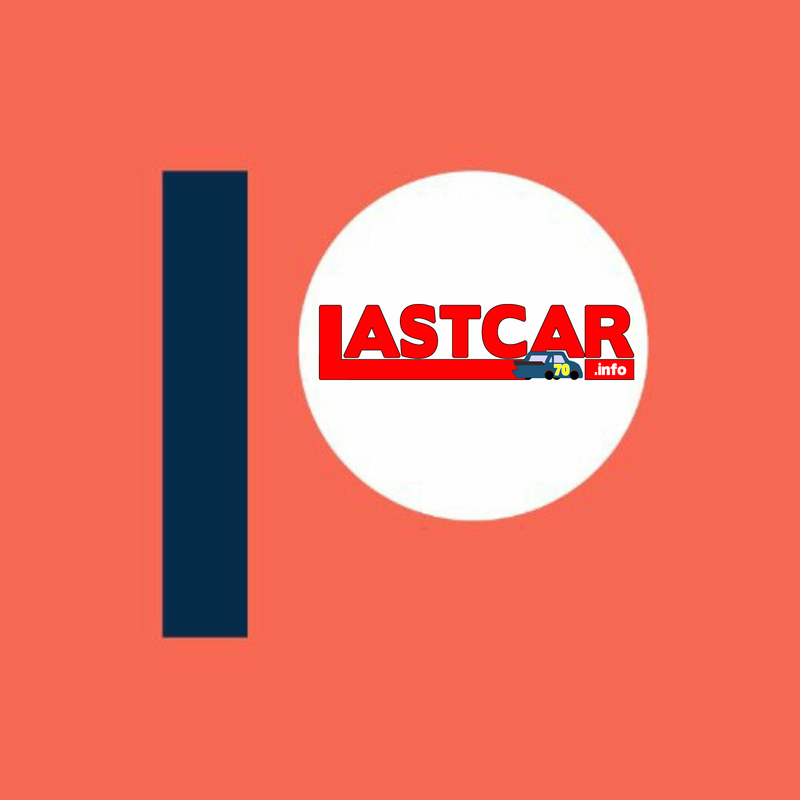 Las Vegas would be Green’s first appearance since then, TriStar having not entered his “start-and-park” #10 last week at Atlanta. His car, as well as that of teammate and 2014 LASTCAR Cup champ Mike Bliss, carried sponsorship from Holiday Inn, which was likely because of an arrangement between the team and the hotel where they stayed for the weekend. Green didn’t participate in the weekend’s opening practice and ran just 36th-best in Happy Hour, but while 42 cars gunned for 40 starting spots, Green was locked-into the field on Owner Points. He secured the 34th spot in qualifying, the highest-ranked of those taking provisionals, at a speed of 171.964 mph. Daytona last-placer Dexter Bean ran two-tenths faster than Green in time trials, but his #92 King Autosport Chevrolet was sent home with the Victor Obaika-owned #97 entry driven by Josh Reaume. Cody Ware started last in his father Rick’s #15 Lily Trucking of Virginia Chevrolet, but just 3 laps into the race, Green pulled behind the wall and out of the event. Just 9 laps later, Mike Bliss brought out the first caution when he lost control of his #19 in Turn 1, made contact with the #51 RepairableVehicles.com / Casedhole Solutions Chevrolet of Jeremy Clements, then turned head-on into the outside wall. Bliss was uninjured, but after just 12 laps, TriStar had two of its cars out of the race. Outside-polesitter Brian Scott became the race’s next retiree when his #2 Albertson’s / Sanderson Farms Chevrolet lost the engine after 14 laps. It was Scott’s second DNF in three races this season, and his worst finish in the series since a career-worst 41st at Phoenix in the fall of 2011. Morgan Shepherd, who trailed last week’s race at Atlanta, fell out one lap after Scott, citing suspension issues on his #89 Racing With Jesus / Courtney Construction Chevrolet. Rounding out the Bottom Five was the Dodge of Carl Long, his 40 Braille Battery / Grafoid machine out with electrical issues. TriStar’s top finishing car on Saturday belonged to David Starr, whose #44 Zachry Toyota finished two laps down in 17th. One spot in front of Starr was J.J. Yeley, who earned his second-consecutive top-twenty finish in Gregg Mixon’s Texas 28 Spirits Stage Toyota. Mixon’s JGL Racing has quietly had a solid start to 2015 ever since Daytona, when two of its cars finished 13th and 17th with Mike Wallace and Eric McClure, respectively. 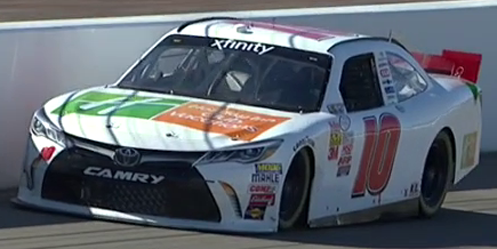 *This is Green’s second-consecutive last-place finish in the XFINITY Series race at Las Vegas. Last year, his #10 also exited after 3 laps with a vibration. Landon Cassill picked up the 7th last-place finish of his NASCAR Sprint Cup Series career in Sunday’s Folds of Honor QuikTrip 500 at the Atlanta Motor Speedway when his #40 Snap Fitness Chevrolet fell out with engine failure after he completed 92 of the race’s 325 laps. The finish came in Cassill’s 153rd series start. It is Cassill’s second-consecutive Cup Series last-place finish. Following their Lap 19 exit from the Daytona 500, Cassill and the Hillman Racing team faced another peculiar on-track challenge. Having timed in 29th and 30th in Thursday’s two test sessions, then 23rd in Friday’s opening practice session, Cassill looked to turn in a fast lap in qualifying, where he’d line up 39th that afternoon. Unfortunately, this random draw left his Chevrolet one of the 13 cars trapped in the inspection cue at the start of qualifying, preventing him from taking a lap before time ran out. As NASCAR attempted to figure out how to set the grid for the back of the field, PRN Radio reported Cassill had secured the 43rd spot - then minutes later said Cassill had lost the spot to the #66 Premium Motorsports entry of Mike Wallace based on his number of race attempts. It wasn’t until later that day that the grid was corrected a final time with Cassill confirmed as the final starter of the race. Wallace was sent home with four other frustrated drivers who never had a chance to qualify. None were more frustrated than Travis Kvapil, whose first start for Team XTREME Racing was scratched when the team’s #44 Phoenix Warehouses Chevrolet was stolen Thursday, forcing them to withdraw. On Saturday, the still-intact car was recovered by local police in the woods outside Loganville, Georgia, followed by the truck a few hours later. Reports indicate that Team XTREME will return to attempt next week’s race in Las Vegas. Following a 33rd-place run in Happy Hour and a 17th-place finish in the XFINITY Series race on Saturday, Cassill rolled off at the tail end of the field on Sunday. Just a few spots ahead of him were past series champions Jimmie Johnson, Jeff Gordon, and Matt Kenseth, who were also unable to get out of inspection in time to take a lap. Outside-polesitter Kevin Harvick joined Cassill as well, having lost his engine after turning the fastest lap in Happy Hour. Sent to the back with Harvick was Michael Annett, who took over Brian Scott’s unsponsored #33 Joe Falk-owned entry after the botched qualifying session dropped Annett’s #46 from the field following a 13th-place run in the Daytona 500. By the first lap of the race, however, all these drivers conceded last place to four-time Truck Series Champion Ron Hornaday, Jr. The 57-year-old Hornaday, who hadn’t made a Cup Series start since the 2003 finale at Homestead where he drove an R&D car for Richard Childress, signed this year with The Motorsports Group, Curtis Key’s venerable XFINITY Series team. Following a DNQ in the Daytona 500, the qualifying chaos locked Hornaday into the 34th starting spot. Hornaday fell to the rear at the start, however, moved past the #23 Dr. Pepper Toyota of J.J. Yeley on Lap 4, then fell behind again on Lap 14. When the competition caution fell on Lap 26, Hornaday and Yeley were both a lap down to the leaders along with the #98 Phil Parsons Racing Ford of Josh Wise, who had also bounced back from a 500 DNQ along with Yeley’s rookie teammate Jeb Burton. Wise took the 43rd spot under the caution after a penalty for his crewman jumping over the pit wall too soon, then Hornaday moved behind him once more by Lap 34. On Lap 49, Austin Dillon stayed out too long with fender damage after contact with Regan Smith and cut down his left-rear tire, dropping debris all over the backstretch. For some reason, NASCAR credited the debris and not Dillon with the caution, so Dillon received the Lucky Dog for bringing out the yellow. This mistake was rectified less than 10 laps later when Dillon cut down another tire in Turn 3, sending him spinning into the grass. With the back of his car both damaged and covered in mud, Dillon pulled behind the wall and took 43rd away from Hornaday during several laps of repairs. If he remained in 43rd, Dillon, who did not DNF a single time during his rookie season in 2014, would have earned the first Cup Series last-place finish for the #3 since September 28, 1992, when the late Dale Earnhardt lost the engine on his GM Goodwrench Chevrolet after 111 laps of the Goody’s 500 at Martinsville. It was the fifth and final last-place finish of Earnhardt’s career, and with smaller fields being common at the time, he never finished 43rd. As it turned out, Sunday’s finish would go to someone else. On Lap 95, Cassill was running 31st, trying to stay on the lead lap during what was becoming a very fast race. Cassill’s Chevrolet sustained damage to the nose in Dillon’s first caution, a piece of debris punching a fist-sized hole near his left-side headlight decal. While repairs had been successful, the engine tightened up, then let go off of Turn 2, dropping oil on the backstretch. For the second week in a row, an engine failure had knocked the #40 out of the race after less than one-third distance. Dillon returned to the track on the ensuing Lap 98 restart, then finally passed Cassill for 42nd on Lap 134. Dillon climbed to 39th in the final running order, first moving past Hornaday, whose lapped #30 broke a rear gear after 187 laps. The other two spots went to Jeff Gordon and Jamie McMurray, who tangled during the day’s first multi-car pileup triggered by a spinning Denny Hamlin on Lap 258. Hamlin finished 38th, just two laps ahead of Dillon and outside the Bottom Five. Turning heads during Sunday’s race was Brett Moffitt. Coming into his Sprint Cup debut last summer at Dover, the 9-time race winner in the NASCAR K&N Pro Series East had made just 3 starts in the XFINITY and Truck Series. Driving the #66 for Identity Ventures Racing (now Premium Motorsports), Moffitt started 18th and finished 22nd, a career-best prior to Sunday. In the six races that followed, Moffitt had not finished better than 34th, failed to qualify at Indianapolis, and endured a miserable night in the Homestead finale where he brought out 2 of the race’s first 3 cautions. Sunday was Moffitt’s first start since Homestead, a one-off driving in relief of Brian Vickers, who returns next Sunday at Las Vegas. In his first start driving the #55 Aaron’s Dream Machine, Moffitt stayed on the lead lap most of the afternoon, led a lap late in the event, and rallied in the closing laps to finish 8th. It’s the best finish by the #55 team since Vickers’ runner-up finish last July at Daytona. *Cassill is just the second driver in Cup Series history to finish last in the first two races of the season. The only other time it happened was in NASCAR’s inaugural season in 1949, when Glenn Dunaway followed up his disqualification at Charlotte with a DNF at the Daytona Beach-Roadcourse. 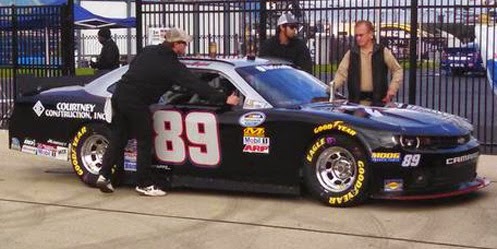 Dunaway claimed the inaugural LASTCAR title as the eight-race season’s only repeat finisher. 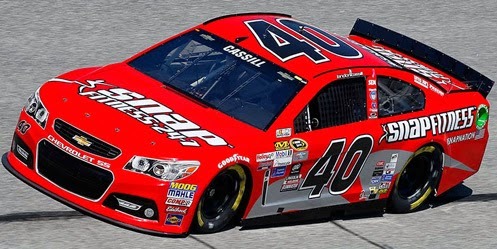 *This is the first-ever last-place finish for Cassill and the #40 in a Cup Series race at Atlanta. Morgan Shepherd picked up the 15th last-place finish of his NASCAR XFINITY Series career in Saturday’s Hisense 250 at the Atlanta Motor Speedway when his #89 Racing With Jesus / Courtney Construction Chevrolet fell out with suspension issues after he completed 2 of the race’s 163 laps. The finish came in Shepherd’s 360th series start. This was Shepherd’s first XFINITY last-place finish since Daytona on July 5, 2013, 52 races ago. Atlanta, the scene of three of Shepherd’s four Cup Series victories, saw the 73-year-old driver attempt both the XFINITY and Truck Series races held last Saturday. The Truck ride came as a last-minute replacement for Timmy Hill, who chose not to race MAKE Motorsports’ #1 Life on the Line / Lily Trucking Chevrolet after Saturday’s practice. Last season, Shepherd finished 35th at Atlanta, matching his best finish of his eight-race campaign. Saturday, as for much of last season, Shepherd carried associate sponsorship from Courtney Construction. 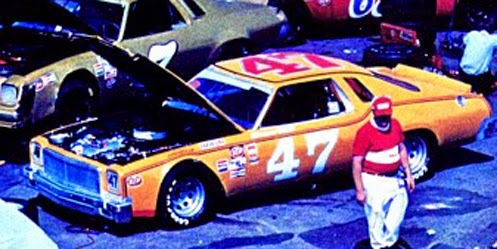 Following the team’s withdrawal from the Daytona event, driver and team went to Atlanta locked-into the show as his silver-and-black Chevrolet made it 40 entrants for 40 available positions. Shepherd did not participate in the opening practice session, ran just four laps in Happy Hour, then timed in 40th in qualifying with an average speed of 158.061 mph, the slowest car by more than 2 seconds. By Lap 3 of the race itself, Shepherd pulled behind the wall with suspension issues. In that afternoon’s Truck Series race, he started 30th and finished 27th. Finishing 39th on Saturday was Carl Long, whose Derek White-owned #40 carried a special tribute to Thee Dixon, who passed away last Wednesday. It was Dixon, then the owner of single-car team Mansion Motorsports, who gave Long his first Cup Series ride in the blue-and-gold #85 Ford. Finishing 38th was Josh Reaume, who at Daytona came home a career-best 23rd in Victor Obaika’s #97 Chevrolet. 37th went to one of only two Dodges in the field - the #74 of perennial underdog Mike Harmon. Rounding out the Bottom Five was by 1990 Daytona 500 winner and three-time LASTCAR Cup Champion Derrike Cope in his #70 Wade Tractor Equipment / New Holland Agriculture Chevrolet, who finished under power. 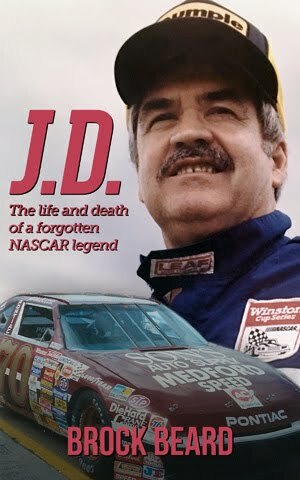 *At 73 years, 4 months, and 17 days, Shepherd remains the second-oldest last-place finisher in NASCAR history, trailing James Harvey Hylton at age 76 years, 8 months, and 10 days during the XFINITY Series race at Darlington on May 6, 2011. Shepherd does hold the age record for Cup Series last-place finishers, which he accomplished in his run at Phoenix last year at 72 years, 4 months, 18 days. 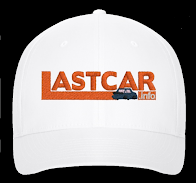 *Shepherd now holds sole possession of 3rd in the all-time LASTCAR rankings with 37 career last-place finishes across all three of NASCAR’s top divisions. 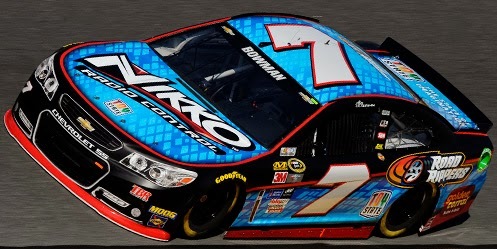 He is 2 finishes behind runner-up Joe Nemechek and 28 finishes behind all-time leader Jeff Green. Green was not entered in Saturday’s race. *This marks the first last-place finish for the #89 in a XFINITY Series race at Atlanta.